When my husband, Butch, was diagnosed with cancer I searched high and low for a book that would help me identify what we were going through, what we were experiencing and what to expect. I could find lots of clinical-type books that told me impersonally what to do and what not to do, but I couldn't find anything that prepared me emotionally or helped to empower us during our journey. Late in 2007 while talking to some 'new' carers, I put their minds at rest about things they were experiencing. After two years into the journey, I could tell them that these were all normal 'carer side effects'. So the idea of this book was born. Before 2006 I didn't know anything about cancer, except that people died from it. I have now learnt enough to know that it is not always the cancer that kills people, but the things that doctors do or say to patients that has a profound effect on whether they survive or not. 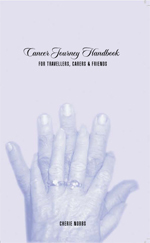 As I wrote this book I also wanted people to be aware of some of the options open to them during their cancer journey, included in a section for carers and travellers. There is also a third section dealing with the many aspects of grief. I believe there is a need for a book that helps you identify what you are going through, to reassure you that you are not going crazy and maybe give you a little insight and inspiration. Hopefully this book will be that to you.